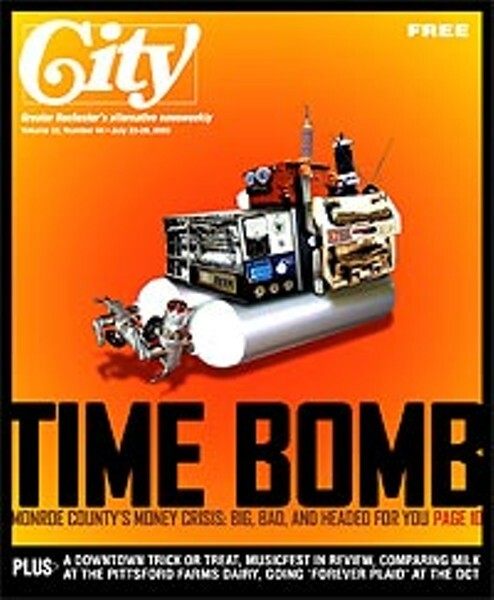 The time bomb is the county's financial situation, severe now, and growing worse. Last year and this year, the county faced major budget deficits. It covered them by, among other things, using a one-time infusion of money: its share of the state's settlement with the tobacco industry. Next year, the county is likely to face an even larger deficit, and there'll be no cigarette money available to rescue it. And county government isn't alone. The City of Rochester is projecting a deficit of $41.2 million next year, a figure that could grow to $110.1 million in 2008. Many of the county's towns, villages, and school districts are also under pressure. That pressure will build as costs increase --- for employee health insurance, for Medicaid, for schools, and probably for social services. Monroe County residents will face dramatic cuts in services --- fewer police, fewer Sheriff's Road Patrol deputies, fewer firefighters, fewer teachers, larger classes, closed parks, deteriorating roads. Support for the arts, for the zoo, for the library, for museums, will be slashed still further. And these aren't the only problems. Rochester's Center for Governmental Research reports that the metro Rochester area --- Monroe and its six neighboring counties --- lost nearly 10,000 jobs from the first quarter of 2002 to the first quarter of 2003. Greater Rochester was second only to Binghamton in job loss, and the loss continued in the first quarter of this year, says CGR. From the beginning of 2002 to the beginning of 2003, says CGR, "the Rochester metro area ranked 268th out of 284 metro areas" in the nation in employment growth. The shrinkage is a sign of the weak Upstate economy, which will continue to impact the property-tax base and sales-tax receipts. And as the local population ages, things could get worse, if the area continues to hemorrhage young adults, its future wage-earners and home-buyers. For the second time in less than a year, a group of community leaders have warned that Monroe County is in serious financial trouble --- and that bold, quick action and long-term structural changes are essential. The latest warning comes in a report from the Council of Governments --- representatives of the city, county, towns, and villages --- and a group of business leaders called the Rump Group. Building on a study by the Center for Governmental Research, the report spells out the problems facing the county and its municipalities and school districts. The city and county are facing major deficits "despite large cuts already made in the last year by both governments that totaled over $40 million," says the report. And, it says, while a national economic recovery "will certainly help," it won't solve the problems. The county and local governments must move quickly to cut costs and save money now. And, says Rump-COG, the community must study options for long-term, structural solutions. Rump-COG deliberately timed the release of the report for the early stage of the county executive campaign, to "contribute to the financial management discussion" in that campaign, and with the hope of having an impact as local governments start working on their next budgets. Short term, says Rump-COG, there are few options. Greater Rochester already has the third highest property-tax burden in the nation, and one of the highest sales-tax rates; tax increases would make the region even less competitive. Increased state and federal aid won't be the solution either, says the report, since both levels of government have their own financial problems. Rump-COG also argues strongly against cutting services to save money. "In an era where quality of life and levels of service are selling points in a competitive market," says the report, "cutting the type or level of public services can be counter-productive. Reducing service levels in the long run has the potential to degrade a community's quality of life and viability, making it a less attractive place to live and do business." For near-term savings, that leaves two options, says the report: to "operate more efficiently... providing services better, cheaper, faster" and to reduce the impact of "unfunded mandates." The mandates are services that the state requires localities to provide but doesn't fund, and regulations that increase costs for local governments. Although Rump-COG suggests that there could be immediate savings from reducing mandates, it's not likely the county could get out from under any of those mandates overnight. In addition, the public may feel that some of the mandates are important, and local governments might be pressured to continue to provide them, state-mandated or not. More likely for immediate savings is Rump-COG's recommendation for "efficiency" --- if the county, city, towns, and villages embrace it. This would mean expanding the kinds of "cooperation and collaboration" that the municipalities already participate in: buying supplies and materials together to get reduced prices, sharing maintenance facilities and services. The report recommends, for instance, that all local governments work together to buy insurance. Much of the media coverage has overlooked the significance of the Rump-COG report: particularly the significance of its long-range recommendations and the potential they offer. The report is not as bold as some might like. And given its authors --- a group of business leaders and the mostly Republican leaders of the county's municipalities, its recommendations have a certain point of view. But it's an unusual, important report; there's no sugarcoating of the problems, no touting of the community's rich resources, no hollow boasting about job creation, no bragging that Monroe County's financial situation is better than that of its Upstate neighbors. And while the specific recommendations are limited, Rump-COG states that the report is "intended to be a starting point." Whether the community moves aggressively from this point, or continues to move slowly and cautiously, nibbling at the edges of the opportunities, will depend on many things, political partisanship, mistrust, and vested interest among them. Already, politics is tugging at the report and attempting to co-opt it. Some elected officials have insisted that the report repudiates Mayor Bill Johnson's call for a study of consolidation; others say the report does no such thing. Perhaps such wrangling dooms the progress that could grow out of the report. But the potential for progress is there, written into the report, if local elected officials, business and other community leaders, and grassroots activists can see beyond their own narrow interests. Rump-COG notes that "cooperation and collaboration" offer the most hope for short-term savings, because they don't require changing governmental structures. But the report by no means slams the door on more extensive changes. It cites the need for "eliminating duplicative functions, structures, and approaches that waste public dollars." It notes that there is a community history of moving "in varying degrees toward full consolidation of services through one regional agency," citing water, sewers, public-safety training, and the 911 system as examples. "Because they are likely to require structural changes, i.e. changes in fundamental laws and/or the way one or more local governments are organized," says the report, "consolidation opportunities are more likely to require a longer time horizon to produce cost-savings, i.e., savings will happen in the long run (after a year or more)." Rump-COG emphasizes that the community must focus on both short-term and long-term measures. "While it is tempting to focus only on those short-term opportunities which can be achieved through cooperation and collaboration," says the report, "structural changes in the way certain functions are provided are likely to offer significant opportunities for achieving cost efficiencies." One of the broadest forms of consolidation would be to merge city and county governments. (That would not be the most extreme form; it would be possible to merge city and county governments and leave town and village governments intact.) But Rump-COG declined to consider a city-county merger. "Without more detailed study," says the report, "it is not clear what level of savings might be achieved from such a merger in Monroe County." And, the report says, a city-county merger would encounter so many "legal and political challenges" that any savings would take place in the distant future. "Therefore," says the report, "the Group believes that the community would be better served by focusing on the functional cost savings proposed in this report at this time." • That the community "rethink the way fire-protection services could be provided in the future." • That the community "streamline and consolidate economic development services." The report doesn't go into detail about either, but handling those functions at the county level could improve quality in both areas. Whether consolidation would save money is a different question. When the community considered metropolitan police in the 1980's, studies indicated that there would be no cost savings, at least initially. The reason: City police salaries and benefits were higher than those of some suburban forces. All would have to be brought up to the higher level, as would the level of service. But significantly, Rump-COG says that cost savings isn't everything. "While creating a consolidated economic development agency for the community might well reduce costs," says the report, "equally important is the need to create a single unified approach to marketing and economic development activities." The responsibilities of such a metro economic-development agency would have to be defined, and the idea could be a politically controversial one. Even if such an agency were in charge only of attracting business and industry from outside the county, it would be a step in the right direction. But more effective, and more valuable to the community, would be for that agency to be in charge of alleconomic development in the county, helping resident as well as out-of-county companies find the right site to locate or re-locate. But under the right circumstances, with the right protections for individual municipalities, consolidating economic-development departments and efforts could end that inter-municipal competition, a competition that is expensive and that diverts the energies of governmental staff from more important, more fruitful development opportunities. Like the study that preceded it --- the November 2002 Blue Ribbon Report on Monroe County Finances, commonly known as the Richards Report --- the Rump-COG report was carefully non-partisan in tone. But it was bound to be drawn into the most volatile issue of the County Executive campaign: some form of metropolitan government, proposed by the Democratic candidate, Rochester Mayor Bill Johnson. Indeed, before the report was released, a portion of it was leaked to the Democrat and Chronicle. And the Republicans' candidate for county executive, Maggie Brooks, told the D&C that the report "represents a resounding defeat of the mayor's metro government [idea] and validates the cooperation and shared services approach that the county has been taking for the entire community for a long time now." Brooks' assessment, however, oversimplifies the report. Furthermore, there are numerous types of metro government, and Johnson has simply said that the community should discuss the possibility. He has not proposed a specific form of metro government. In fact, far from rejecting any form of metro government, the Rump-COG report specifically endorses one type: a two-tier form of government recommended in the early 1970's by a blue-ribbon group called GRIP-NAPA (Greater Rochester Intergovernmental Panel --- National Academy of Public Administration). GRIP-NAPA's concept was to create two levels of government: Individual local governments would deliver the services that were most appropriately delivered at the local level. An "area-wide" government would deliver services needed by the general population, services that could be delivered most efficiently and most effectively by a single, larger government. The Rump-COG report notes that since GRIP-NAPA, there've been many consolidations of services. And, the report says, "many additional opportunities remain to reduce the cost of providing local government services by using efficiencies of scale without reducing service quality." "The strategies to achieve these savings," says the report, "are to cooperate, collaborate, and consolidate, within the framework of the two-tier model of regional governance." As the Rump-COG report says, there've been important consolidations of services since the GRIP-NAPA report. Most of them, says the report, "have occurred incrementally, on an evolutionary basis." But many of GRIP-NAPA's recommendations have been ignored, as has the basic concept of a true two-tier metro government. The Rump-COG report opens the door for the community, at a minimum, to look at the services that could be provided more effectively --- and perhaps less expensively --- by the "first tier" of a two-tier government. You could argue that Monroe County already has a two-tier form of government, with the county handling some services, and the city, towns, and villages handling others. But Rump-COG recommends expanding what we have. Perhaps as significant as its specific recommendations is that --- like the November Richards report --- Rump-COG makes it clear that the Community of Monroe is in crisis, that we can't wait much longer to deal with that crisis, and that we can't deal with it in the same old ways. The report could serve as an important discussion point in the county executive race, helping candidates and voters focus on opportunities rather than slogans and fear. That will require temperance and thoughtfulness from the candidates and their political parties, attention from voters and special-interest groups, and major space and air time from the media. For the community, the convergence of the financial crisis and the election offers a unique opportunity: to participate in planning the county's future. The county and its municipalities can't escape dealing with the crisis. It's far better to draw in the public, through the election campaign and craft well-thought-out solutions than to respond piecemeal, in panic.